The experience of cinema is an intensely personal one, not simply in terms of what we like or dislike but how a film or a performance can touch us and leave a deeply lasting impression. A film can caress us, soothe our emotions or it can jar us with a violent intensity that shakes us to our core and challenge our values and beliefs. Speaking for myself, Vertigo is a film that haunts me – it is has done so since the first time I saw it and does so after every viewing. Vertigo has had a polarising effect, to some degree. A film that was famously panned on release by The New Yorker and Variety and disliked by Orson Welles, was stilled liked and favourably reviewed by the acerbic Bosley Crowther. The film barely broke even at the box office with fans thus showing their disappointment. Despite eventually removing the film from circulation and outlining his own criticisms, Hitchcock would himself go on record during an interview with Francois Truffaut that Vertigo was a favourite. It would be re-released after Hitchcock’s death and following a restoration and showing in San Francisco in 1996, the film’s reputation has become almost obsessive amongst film critics and cinephiles. Perhaps more than any other event to cement its’ reputation was Sight And Sound leapfrogging Vertigo over Citizen Kane as the most influential and greatest film ever made. Yet there has been much critiquing over Hitchcock’s depiction of women, most recently and famously by Anne Bilson in The Guardian, which whilst not denigrating the value of the film certainly brings into questions the motivations of its’ director. Additionally, critics in recent times have spoken much about the nature of the ‘male gaze’ and the stylising of Hitchcock’s ‘sexual creepiness’. Whilst tempting to analyse the mis en sceneand how Hitchcock achieves his vision through via his framing of Madeline (Kim Novak), my aim here is to look at what I feel is a key theme of the film and one which Hitchcock addressed in a number of his films: obsession. Much has been written about Vertigo and I don’t want to spend time simply recounting the storyline. It is far better to watch the film and for those who have seen it, it would be superfluous to detail the plot. However, as a quick reviser, I will attempt a run-through for the purpose of focusing on the discussion point. The film tells the story of John ‘Scottie’ Ferguson (James Stewart), a former cop who has retired due to his developing a combination of acrophobia and vertigo. After a period of recovery following the traumatic end of his career, he is hired by Gavin Elster (Tom Helmore) who wants Scottie to keep an eye on his wife Madeline (Kim Novak). Initially reluctant to take the job, he accepts it and the seeds to his obsession are planted. Scottie relents and begins to follow Madeline, saving her from an attempted suicide and eventually falling in love with her. Tragedy ensues after expressing love for each other whilst visiting the Mission San Juan Bautista, the childhood home of a woman named Carlotta who committed suicide and whom Madeline has become obsessed with. Despite the moment of truth, Madeline breaks away from Scottie, who paralysed by his acrophobia cannot prevent her from running up the bell-tower and plunging to her death. Her death is deemed a suicide and whilst Scottie receives no blame, he falls into deep depression and catatonic state, leaving him institutionalized. Upon his release, Scottie seeks out the places that Madeline visited and incredibly sees a woman that resembles Madeline. She claims her name is Judy but there is an incredible twist. Madeline and Judy are the same woman, as she had been impersonating Madeline as part of a murder plot. But by the time Scottie discovers this, Judy has fallen for Scottie and continues the pretense, hoping that they can be happy together. But Scottie is still obsessed with ‘Madeline’ and forces Judy to change her appearance to look like the woman he still loves. But whilst they seem to be happy, Scottie will discover the truth and his world is again turned inside out, leading to the incredible climax. So how does obsession rear its’ formidable self in Vertigo? The title itself is multi-layered and suggests more than just Scottie’s medical condition. The nature of vertigo is the inability to maintain balance, perception and focus and certainly Scottie suffers from this. The end of his career sees the beginning of a trauma from which sees him struggle with his own sense of identity and worth, particularly with his ‘failure’ during the rooftop chase at the start of the film. Already, Scottie faces a vulnerability, which of course will open him up to the intimacy of romance and need for the woman he will fall for. But the title also pre-supposes and foreshadows the further depths of confusion and depression that Scottie will fall into much later. More importantly, Scottie’s obsession with Madeline is also a form of vertigo, where the dizzying heights of his desperate fixation cause him to lose sight of his reality. This confusion is also emblematically symbolised in the use of mirrors which allows for a different gaze and the suggestion that all is not what it seems, as well as the concept of voyeurism. The first time that Scottie sees Madeline is perhaps one of the most complex, highly stylised and brilliant scenes Hitchcock ever framed and shot. It is in Ernie’s Restaurant that Elster has convinced Scottie should come to surreptitiously familiarise himself with Madeline in order to follow her. Again, there has been much detailed analysis regarding this incredible moment, but it needs to be examined with obsession in mind. Here, Scottie’s obsession will be anchored and Hitchcock will play with our perception of what we view as an audience. The scene begins with the camera merging both the viewpoint of Scottie and the audience, with the camera languidly moving through the restaurant, decked out in lavish, rich red tones to see in the background the back of Madeline, resplendent in green. The gaze is Scottie’s but it becomes ours and we are clued in to something special happening, with Bernard Hermann’s haunting and beautiful score underpinning the moment. But Hitchcock’s stylising of the scene, using the physical frames in the restaurant to frame Madeline is symbolic of Scottie’s own fascination. He will later idealise her and attempt to frame Judy in the same way, with an obsession that is all consuming. As Madeline leaves, she pauses for a moment where a close-up of Madeline establishes her ethereal and ghostly beauty, in a voyeuristic moment for Scottie but also for the audience. His illicit looks betray more than he intends and Hermann’s score lifts the scene into a transcendental moment. Scottie is trying to appear nonchalant but he cannot hide his awoken feelings for Madeline and the truth is that he’s hooked. Indeed, she is so breath-taking that the audience is perhaps also becoming obsessed during the close-up, whilst feeling Scottie’s desire to look at her as the camera inter-cuts between them. It is an obsession that will consume Scottie and one he will not recover from. Yet deception also walks arm in arm with obsession, most evident with Madeline’s fixation on Carlotta, the beautiful woman from the past who committed suicide. Gavin Elster believes Madeline is haunted by Carlotta’s spirit and sets the context for why Scottie is supposed to follow her. But this obsession on part of Madeline is false and part of the charade in drawing Scottie in. Or is it? Is Madeline starting to fall for her own deception? Much like the classic femme fatale in film noir, deception is an art by which the femme fatale gets what she wants and/or leads the unwitting fool down the garden path. Scottie starts to see her more and more as a spirit or some kind of phantom, aided and abetted by Madeline’s talk of the past and the strange and mysterious demeanour she channels. And of course, this feeds his obsession to the point where there is no turning back. Director Martin Scorsese makes the point that when first seeing Vertigo as a teenager, he did not fully understand it but he was deeply drawn into the film and was impressed by the camera work showing Scottie follow Madeline around. He makes the point that Hitchcock crafts Scottie’s descent into obsession with subtle poetry. Mark T. Conrad in Philosophy Of Noir (2006) raises an interesting point which adds meaning and understanding to Scottie’s obsession; the problem for the protagonist with their own existence and the meaninglessness of life. Scottie is an unmarried man with a career in tatters due to a traumatic past. The woman he has fallen in love with is someone he is watching and following around, and yes there are obvious voyeuristic elements here (which speak deeply to Hitchcock’s own obsessions and psycho-pathology). But the real obsession begins after Madeline’s apparent suicide, where Scottie has lost the woman he loves in an incredibly tragic and appalling manner. Unable to cope, he falls into catatonia and is institutionalised. Hitchcock depicts Scottie’s mental collapse in an alarming yet fascinating way and though eventually released, he begins to frequent the places that he visited with Madeline. There is nothing left for Scottie but to relive the moments he had with her, with all the sad and pathetic reality of a broken man who has nothing left but memories to obsess over. As an audience, it is impossible not to feel incredible pathos for Scottie, desperate to see her again. Perhaps one of the most intriguing moments is Scottie returning to the restaurant where he first saw he. It is the hope of the hopeless and Hitchcock brilliantly frames the scene exactly as he did previously, so that for a fleeting moment the audience believes they will see Madeline as well, only for the spell to be broken by harsh reality. His chance sighting of Judy, during his desperate search, fuels his obsession and here we see Scottie lose himself completely to his absorption in Madeline. The incredible and uncanny resemblance (sansHitchcockian blonde hair and dress-suit) to his lost love tips him into following her and eventually making contact. At the risk of revelation of the film’s twist, the audience discovers that Judy and Madeline are but one and the same woman, with Judy being paid to impersonate ‘Madeline’ in a murder plot and make the death look like as suicide. The audience knowledge of this, adds a powerful dimension to what will follow. The audience discovers that Judy/Madeline also loves Scottie and her reluctance to see him becomes intertwined with her desire for him. But the complexity of Judy’s position becomes problematic as Scottie’s obsession is relentless in his attempts to turn her into the physical embodiment of Madeline. “Judy, please, it can’t matter to you,”he implores her but the audience realises that it does. There exists the fear that he will discover the truth and any hope of love being realised will become extinguished. Yet for all her concerns and the eventual realisation that Scottie’s obsession blinds him from seeing the truth, Judy will do what he asks, with the hope that he will love her. As she begs him, If I do what you tell me, will you love me? it is impossible not to feel deep sympathy for Judy, despite the subterfuge she has engaged in and still involved in. She is a woman frustrated by a man not loving her for who she is but what his obsessive and idealised vision of her is – imprinting on her being what he desires, using her as a mannequin for his own needs and wants. Yet she continues with the illusion – love has tragically misguided her as well. Jim Emerson brilliantly channels gothic writer Edgar Allan Poe when he states, ‘Scottie is so obsessed with creating his “work of art,” that he doesn’t even notice that he’s draining the very life from his subject’. And herein lies the tragedy of the story and the damaging aspect of Scottie’s obsession. Unable to deal with his reality, he cannot make the physical connection with any flesh and blood woman, whether it’s his ex-fiancée Midge (Barbara Bel Geddes) or Judy. It is a heart-breaking moment when she exclaims, ‘“You can’t even touch me!”; fully aware that he prefers the illusion of Madeline (the character she created) to the actual woman before him. It will take a complete transformation for Scottie to respond physically as well as emotionally. The scene where Scottie’s obsession is completely realised is perhaps one of the most beautiful and tragic ever filmed. Finally yielding to Scottie, Judy had dyed her hair. The risk that Scottie may discover the truth is now greater than ever but it is still not enough – Scottie states that her hair isn’t up the way it should be. Judy is afraid yet also hurt that he does not love her for herself. When the final step must be taken, Judy goes into her bathroom and emerges, completely transformed into Madeline. Bernard Herrmann’s haunting and beautiful score reaches its’ powerful crescendo as she stands ghost-like before Scottie; a phantom that takes him back to that moment during the earlier garden sequence, when their love was first realised. The symbolism of green is never more marked in the film than this moment, a symbol of re-birth, as critic Jim Emerson suggests, as well as the constant love that Scottie has felt – and I would suggest his obsession. As they embrace, Scottie’s world now seems complete and the room bathed in green, suggests that romantic renewal. Yet it also suggests that the illusion has also won over and reality has taken a back-seat to fulfil Scottie’s obsession. But Judy/Madeline has also bought into the illusion and this is evident as she moves forward from the ghostly stance at the bathroom door into a close-up. Her reluctance morphs into what seems like a look of victory, as she sees Scottie is finally fulfilled and his re-shaping of her realised. Yet watch the moment when she steps closer; her own surrender is obvious and her love for Scottie tragically evident. The look in her eyes and the slight turn of her face betrays her own ‘happiness’ that now Scottie can love her completely and that the two of them can find happiness. Bathed in the symbolic green of love, the camera swirls around the couple as they kiss and embrace. It should be the culmination of everything they have wanted. Even if it is an illusion. It is an illusion that will come crashing once reality hits their relationship, like a stone smashing a mirror. And therein lies the tragedy of obsession – that Scottie’s fixation on an illusion could never be sustained and when the truth is revealed, it is almost too painful to bear. And yet even at the critical moment during the climax of the film, when Scottie and Judy revisit the scene of the earlier trauma, there is a moment where their love is realised as the illusion is removed. Has Scottie overcome his own psycho-pathological problems? 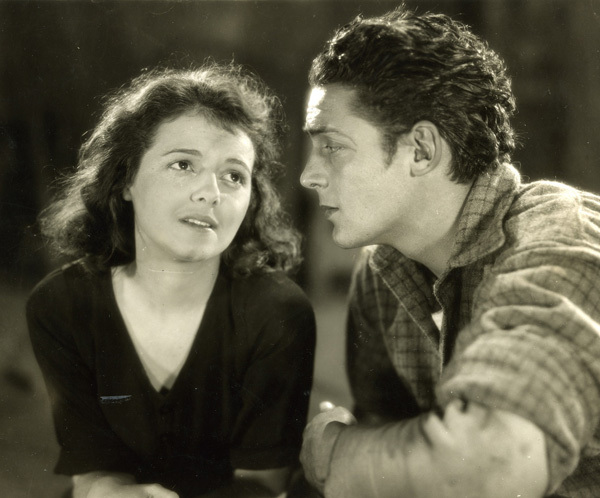 Much has been recently written about the misogyny of the film, in terms of the male gaze as developed by theorists such as Laura Mulvey, and a somewhat justified feminist perspective of the obsession of men to reshape women according to their standards. Yet recently Anne Billson in The Guardian stated that ‘Vertigo…mercilessly scrutinises romantic love while swooning over it’and ‘it is not an example of misogyny, but an overblown, beautiful and tragic deconstruction of it’. In essence, there is also the interesting allusion that in the arena of love, lies and deception are commonplace. Scottie is ultimately a man without an identity; one which has been shattered by his traumas resulting in a loss of sense of self. To find meaning in a meaningless world, Scottie becomes a man obsessed and even when the fixation (as far as he knows) is gone, the obsession remains even after complete mental collapse. It is arguable that Judy is the typical femme fatale in film noir who has fooled Scottie and led him on through deceit. Yet Judy is also a victim of the illusion, as much as the creator of it and her sense of identity is also obliterated to meet Scottie’s obsession. And arguably both Scottie and Judy have been manipulated and been taken advantage of by Gavin Elster, who has used Scottie’s weaknesses to establish his murder plot. Conrad describes Scottie’s vertigo as being ‘spiritual’ as much as psycho-physical and this has also led Scottie into his obsession, as he searches for something deeper to fill the void. Scottie’s love and obsession for Madeline transcends death and her ‘re-birth’ also transcends reality whilst simultaneously bringing the illusion to life. Obsession is not only a theme instilled in film noir but one long-investigated by Hitchcock and one that has perhaps never been better examined in any of his films. Despite the reluctance of audiences and critics to embrace the film on its’ initial, Vertigo has established itself and held onto its’ lofty place in cinema. It’s a film that is stylistically resplendent but not for its’ own sake and reaches incredible depths of meaning and denotation far beyond what other films which they could achieve. Hitchcock uses very cinematic technique at his disposal, in the way a master painter uses the palate and expands the canvas in a way never done before. If we as an audience are still obsessed with Vertigo, it’s not without good reason. This article was to have been submitted for the Alfred Hitchcock Blogathon, hosted by Maddy Loves Her Classic Films – but is ridiculously late! My sincerest apologies to a kind and wonderful host, as well as being a passionate cinema buff and writer! I personally do not have a problem with Hitchcock’s portrayal of women and don’t particularly find it sexist. In fact, his female leads are generally very smart and hold power over people and situations. I find that he gave them a lot of credit in a male dominated world of cinema. It’s funny because I’ve never considered Scottie to really be obsessed with Madeleine. To me, he was desperately in love with her and painfully wounded after her death. Re-creating her image in Judy would be even stranger if Judy had been against the idea. However, she is so in love with Scottie that she’ll also do anything to have things as the way they were before. These emotions are certainly not healthy but it is how they have chosen to cope with their losses. Thank you so much Erica. I agree that there are many examples of strong women in his films and Anne Billson makes that point as well. There’s no doubt that Scottie is deeply wounded and desperate after Madeline’s ‘death’ and Judy certainly loves him – so much that she is willing to lose her identity for him. As you point out, their feelings are not healthy and perhaps the film is making the point that love is the most complex human emotion and experience that the blurring of love with obsession, illusion and a host of other emotions comes into play. One thing is certain for me – it’s a tragedy as much as it is film noir. One of the most beautiful tragedies ever filmed. No need to apologise at all, Paul! Brilliant review. 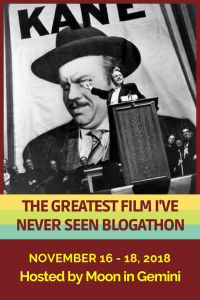 Thanks for joining the blogathon. I’ve added your post in with the others. I love this film so much. I often change my views and opinions of the characters in this. It’s a dark and moving love story, but Scottie is the real victim of this film. He loved Madeleine and unbeknown to him she was lying to him. He was used and he suffered the loss of someone he loved. He suffered a breakdown and then he becomes obsessed with bringing his love back to life(moulding Judy in her image). It annoys me when some say that Scottie is creepy and twisted, when he is actually the victim of the film and has been used and lied to by Madeleine/Judy. She becomes the victim in the second half as she loses her own identity. We can pity her when she regrets what she did to him, but her actions contributed to him becoming a damaged and obsessed man. James Stewart did some of his best work in this film. Thanks so much Maddy. Of all the great films we love, this is one that doesn’t let go of me and I must admit I struggled with writing about it, because there is so much to say about it and it reaches so deep inside. I can understand some people seeing Scottie’s actions as creepy, although I am not one of them, but I think they’re missing the point. The unfathomable pain and trauma of losing someone you love in such a way drives him to that obsession. And yes, it’s easy to focus victimhood on Scottie but Judy is also a victim – of Gavin Elster initially and also later in the film. I break down EVERY time in the scene d’amour when her face betrays her happiness and hope that finally he can love her and Kim Novak’s face gives that slight turn of surrender. There may be an unhealthiness in it all but there lies the tragedy and irrational nature of love – and if Vertigo is anything then it is one of the most powerful tragedies ever filmed. Oh how I love this film! This textured film has many layers, and it takes a lot of time and care to unravel it, which you have done. I think I’m going to have to see this one again, very soon. Thank you so much! To be honest, writing about Vertigo was not so easy – as you point out there are so many layers and the more one looks, the more one finds. It has to be Hitchcock’s most tragic and poignant masterpiece. Most of us are too busy living our lives to let our obsessions become more than mild irritants leading to weird dreams that shake us in the morning before getting on with things. In Hitchcock’s exploration, we have two people, Scottie and Judy, are coming at the Madeline obsessions from different directions and it can only lead to tragedy. It is fascinating. That is a beautiful and poetic observation – and one that I would love to use in the future, if I may! It is a fascinating film and I feel its’ Hitchcock’s greatest; making poignantly clear that love walks the fine line between extreme happiness and tragedy. Thank you. Feel free to share. Brilliant analysis. It’s amazing how there’s still so much to say about this masterpiece. Thank you Carol. I don’t think we can ever stop talking about it and discovering more underneath its’ layers. What a beautiful though tragic story! What an amazing essay. I thoroughly enjoyed it. I wish I could say something more intelligent about it but I haven’t watched the movie in about 20 years. I’ll get right on to it. Thank you Margot! I’m glad you enjoyed the essay. I imagine you will love the film far more – it’s so layered you could spend an eternity pulling them back. Would love to hear your views on the film after you watch it. I have watched Vertigo countless times, including two screenings – years apart – at the San Francisco Symphony with the orchestra performing Herrmann’s exquisite score. Many years ago I hosted “A Month of Vertigo” on my blog, wherein 12 or 13 bloggers (including me) contemplated the film from different perspectives with each piece posting, one at a time, every few days. All this to say, obviously, I am a great fan – possibly obsessed. Naturally, I read your article with great interest – and profound enjoyment. The film is endlessly layered, a feast for the eyes and mind, and, for those who respond to it, so emotionally compelling that I imagine it will continue to be explored and examined and pondered again and again. There is always something to be discovered, don’t you think? As you commented, there is so much to say about Vertigo. And though you may have struggled in writing about it, you offer a deeply thoughtful and insightful analysis. Thoroughly engrossing. Thank you! Thank you so much! I must find that link to the Vertigo blogathon you hosted and read through the entries – and I think I am also a little obsessed with the film as well. It’s a deeply personal film as well, because of its’ many layers. As you point out, there is always something to discover and its’ enduring power lies in that fact as well. Thank you for you kind words and appreciation of the review – I guess I struggled because it feels so personal as a film and because I wanted to write a review that did some justice to its’ brilliance. A wonderful read, and an excellent choice of film. I think this may be your best essay yet, and that is saying a great deal. “Vertigo” is a film that improves with each viewing, a film full of complexities and subtleties, which your essay explored in great detail. Certainly Novak’s best work, and close to Stewart’s best; having previously played such characters as George Bailey and the lovable Elwood P. Dowd, his portrayal of a darker character in “Vertigo” really broke his “good guy” mould. Stewart’s “Scottie” is not creepy or psychotic in the same manner as Hitchcock’s later protagonist Norman Bates, but he is definitely a man obsessed. Yet he is a simultaneously a sympathetic character, a pawn in an ugly scheme. “Vertigo” is required viewing for any serious fan of cinema. It is so fortunate that the film is readily available today on DVD and blu-ray. Although unavailable from viewing for 15 years, from 1968 until its release on VHS in 1983, I distinctly remember seeing this film, along with “Rear Window” and the Stewart-Doris Day version of “The Man Who Knew Too Much”, both of which had also been pulled from circulation in 1968, on television in the early 1970’s; the network that broadcast them apparently did not actually have the legal right to do so. Thank you kindly Robert – at the risk of sounding conceited, I feel it’s the best I’ve written and I’m really honoured that you thought so as well. To be honest, I struggled with it as it’s such a personal film and I wanted the review to do the film justice. It is a film that I find myself obsessed with and I’m constantly enamoured and drawn in by it. I can see how some may see Scottie as creepy though I never have and lean towards sympathy for him, despite the unhealthy obsession he is engaged in. It’s perhaps one of Stewart’s finest performances and a brave one at that. I agree that it’s required viewing and no film course can ignore it – it’s genius at every level. I am dying to see it on the big screen and lose myself in its’ brilliance. What an excellent article! As always, you looked very deep into the heart and mind of the film and the people behind it. This is a very intellectual but also very entertaining examination of one of Alfred Hitchcock’s most famous works. 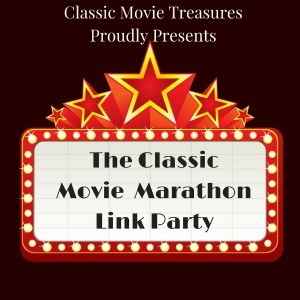 By the way, congratulations on becoming a member of the Classic Movie Blog Association! I wanted to remind you that you agreed to write the March article in our series “What the Code Means to Me.” If you are still working on it or have not yet begun it, that is fine. We are not even half-way through the month, and you can publish through March 31. I just wanted to be sure that you were aware that you had claimed this month. I know how easy it is for me to lose track of time! Thank you, Mr. Batters! I hope that this finds you well. Thank you kindly for your response to my article on Vertigo. It is certainly a favourite film of mine and I appreciate that you enjoyed it. I am still working on my article and should have it completed soon. It will definitely be ready before the end of March. Thank you so much for the kind reminder! Looking forward to reading the other entries as well. It was so good to hear from you. It is very reassuring to know that you are working on your article! You are a very thorough, reliable writer, so I am not worried about your contribution. I look forward to reading your article soon. You will be the first participant in the series!